The 10.2 megapixel Sony A300 features a flip-out 2.7-inch swivel screen and live preview that retains the ability to autofocus with speed. 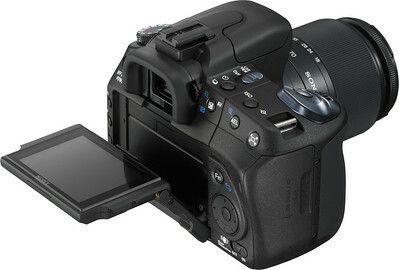 The A300 features sensitivity up to ISO 3200 and feature burst modes of 3fps. 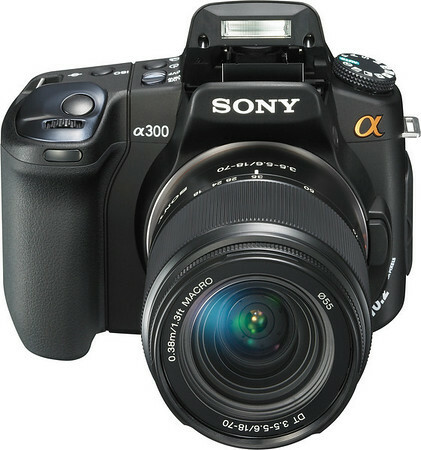 The A300 was made available in April 2008 for $800 with a 18-70mm kit lens (now substantially less). Image quality is pretty much identical to the A200, so no surprises there. The same 10.2-megapixel APS-C sensor has been used in the A100 and A200, as well as the Nikon D60 and D80, and it is a well-proven piece of kit. The Sony A300 is certainly a fun camera to use, owing to its zippy Live View performance, tilting screen and advanced feature set. While plastic, it is well made, looking and feeling like it was built to last. Despite some evidence of edge softening, resolution was retained right up to ISO 1600 and only declined slightly at ISO 3200, as shown in the graph below. Flare was negligible with the supplied lens and the test camera’s spot metering system provided correct exposures with strong backlighting. The Sony Alpha A300 is a feature-packed DSLR with a compelling price tag. With built-in stabilisation, Live View and a flip-out screen, it ticks the boxes of most new DSLR buyers. Sony’s fuss-free Live View is also arguably the best implementation yet for general consumers. It’s quick, quiet and offers uncompromised auto-focusing performance. The camera focuses quickly as you aim the lens, without ever blacking out the screen. When you press the shutter, the screen doesn’t go on-off-on, there’s no loud clacking, and there’s no baffling exhibition of mirror calisthenics inside the camera.
. . . we’re here with a plethora of hands-on shots to prove that they’re the real deal. Since you already know the specs by now — 10.2 megapixel (a300) or 14.2 megapixel (a350) sensors, 2.7-inch screen, ISO up to 3200, and traditional CF slots — we’ll just let you get right to the eye candy below. The only reason anyone would want a darn A300 is if its Full Frame!!!! It could even be 4 frames per second with a frame limit and just under the A700 but if its just a step in between the A200 and A700… booooorrring! Sony is gonna blow it if they dont think of ways to smash the competition instead of float with it! Sweet enough looking live view machine….with the A100, A200, A700, A300, A900 all to be on the scene soon, Canikon will start to feel the pressure. Wow! Go Sony ~ Sony Alpha goes strong this year and the next we will get respect in the DSLR business. More Power! It takes more than two years to earn respect and even longer to build a reputation. That KM heritage is lost on newbys, so hope you’re not planning on that keeping you warm. I like what Sony is doing; aggressive marketing and all. That’s where there fat bank comes into play. When I see the photojournalists at major sporting events pack Sony gear I’ll entertain your rah rah “more power” blast. Until then Sean and Don “Sony Fanboy #1” can take a back seat and watch how the true players continue to release features that actually work. The Sony A300 seems to be the best overall Sony alpha model for the masses to me. 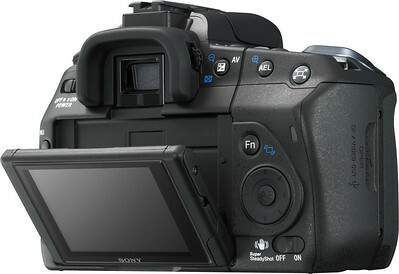 The sony a300 reviews seem to echo this? It’s like the A200 plus a little bit more, without going to the A700 and A350. Obviously Nikon is using sony chips in their dslrs for good reason. Don’t tell the photo journalists that! Sony Alpha 200 and 300 (I own one of each) – great, great cameras. I love ’em. Easy, quick custom white balance, wireless flash (eat your heart out Cannon). Just a good functional camera. If you pay attention to reviews and comments the sony alpha A300 is better then both the Cannon XSI and the Nikon D60 i think sony is a very good choice for an entry level DSLR. I bought an A300 in Dec 08 for $599.99 at Best Buy which included a 75-300mm lens and have only take 1 out of focus picture with it out of over 500 pics. This is a darn good camera, really easy to use (especially for the beginner). Haven’t even started using all the features yet but I am sure I will not be disappointed. The only thing that bothered me is the shoe for the flash does not match my flash. I can buy an adapter for it but don’t know how it will perform. Here are some samples of a Sunday shoot I did. Bought Sony A300SLR from Jessops in the spring 2009 to replace my 28 year old 35mm SLR Practica. Easy to use for taking photos for the Imagine Group of which I am the Chairman.The only problem is that like all equipment you have to buy their equipment to fit most of the time. Very good photos,but auto can catch you out focusing on a closer item in the picture not what you were aiming for, but easy to correct whithout having to see results from the chemist. Taken more photos with A300 than I ever did with the 35mm as don’t have to load film in 36 photos to a roll.